With a design dating back nearly 100 years, this superb hoe is a perfect present for a gardener who cultivates vegetables, grows potatoes or wants to start a new veg plot! 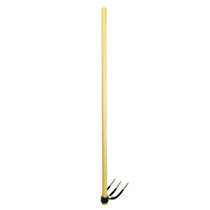 The Canterbury hoe is recommended for breaking up hard, compacted and heavy clay soils. It has a 120cm (4') hardwood handle and solid forged head to give you years of good service. Ideal for 'earthing up' potatoes!